Our recent webinar, “A 360-Degree View into Network Security Management with Panorama,” which discussed the enhanced features of Panorama and ACC in PAN-OS 7.0, was our most popular to date and received so many questions that we couldn’t address them all during the allotted webcast time. So the Palo Alto Networks product management team provided answers to your questions on functionality, speed and more. 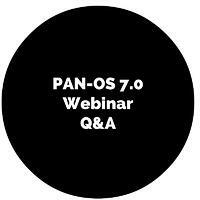 We will continue to answer questions from our PAN-OS 7.0 webinar every week, so stay tuned.